作者: The AsiaN Editor on 17 March , 2017. The interest with Korean food is increasing very quickly all over the world. The Instagram pages of famous channels related to food such as, “Bon Appétit Magazine,” are pushing a lot in order to sponsor Korean dishes. However, what surprised me most is the attention that Italian people are putting in this topic too. My country has a huge food heritage and for this reason it is usually not very open to other national dishes. These days, however, especially in Milan, more and more people are becoming interested in this topic. In fact, thanks to Expo 2015’s theme, “Feeding the Planet, Energy for Life”, the pavilion of South Korea advertised national food and ingredients. However, what are we talking about when we talk about Korean food? First of all, there are different influences to take into consideration such as the geography of the country (the seaside provides seafood and seaweeds while the mountains provide plants and herbs), the climate (hot and humid summer and freezing winter), the history (the Japanese and Chinese dominations, the deep relations with USA), and the culture (Buddhism and Confucianism) among other aspects. The most common foods in Korea are rice and kimchi. The importance of rice, often mixed with other grains such as millet or barley, is found in the word pap that means cooked rice and full meal too. Kimchi, the fermented vegetable dish with a variety of seasonings, has been rated as one of the most perpetual and healthiest foods in the world. In traditional preparations, it was stored underground in jars to be kept unfrozen during the winter months. There are hundreds of varieties of kimchi with the main ingredients being napa cabbage, radish, scallion, garlic, ginger or cucumber. “The result is a dish rich in vitamins A and B and with abundant lactobacilli, the beneficial bacteria found in yoghurt, and in a healthy gut. For researchers, the benefits are manifold — from fighting cancer and lowering cholesterol to improving mental health and skin care” Financial Times reports. The influences of Western culture brought new fusion dishes in South Korea such as kimchi pizza and carbonara rice cake. However, the elements that really changed the Korean diet were chili pepper and instant noodles. “The hot and spicy red peppers known throughout Korea are supposed to have originated from South America, specifically from Brazil, Paraguay and Argentina. During the great age of navigation, through people like Columbus, the spices were transported from Brazil to Portugal and then to Spain; in effect, distributing them all over the world” EthnoScopes reports. According to this theory, red peppers were introduced to Korea at a certain point in the 16th century by the Japanese, but recent studies assert that gochu (chili pepper) can only be grown and harvested on the Korean peninsula. According to other theories, the chili peppers arrived in Korea through the Chinese as well. In any case, whoever brought chili peppers in South Korea, using gochu in recipes became the beginning of a new era for Korean food. On the other hand, instant noodles (ramyeon) entered the local market in the 1960s when the country began clawing its way out of the poverty and destruction of the Korean War. Daily Mail said that while Japan is considered the spiritual home of instant noodles, South Koreans eat more instant noodles per capita than anyone in the world. They consider instant noodles an ideal remedy for aches, alcohol-laden bellies, and subsequent hangovers. The low cost (less than a dollar a package) also increments the consumption of this product. “Convenience stores are also a mecca for ramyeon lovers. Not only you can buy ramyeon at Korean convenience stores, which are usually open 24 hours, most also have a large tank of boiling water that allow you to prepare your cup of noodles on-site. They also offer free disposable wooden chopsticks, as well as a long bar or shelf where you can stand and consume your instant feast” (KoreaNet). Instant noodles also require a minimum of cooking skills and are ready to be eaten in few minutes. However, eating instant noodles more than twice a week was associated with a higher prevalence of metabolic syndrome, another heart disease risk factor. If chili peppers and instant noodles have revolutionised the Korean diet, consumption of meat in this country is at least something to mention. In fact, Korea Times said that Korea’s per capita meat consumption breaks down to 24.3 kg of pork, 15.4 kg of chicken and 11.6 kg of beef with its total larger than China and Japan by 4 to 16 kg. There is even a Samgyeopsal Day, a marketing initiative and an excuse to eat samgyeopsal (pork belly). It takes place every March 3rd because the number three is pronounced ssam, hence ssam-ssam. In addition, eating fried chicken or barbecue for dinner is a very common choice: so, in short, South Korea is a carnivore’s paradise. However, in the previous years and especially thanks to the increasing of the number of vegan and vegetarian foreigners in the country, the attention about the sustainable diet is growing. Many blogs and applications help people find restaurants and cafes where vegan and veggie-food is available. Moreover, last October, the first Vegan Festival was established at Seoul Innovation Park. However, in a way, the Korean diet was originally vegetarian. In fact, according to the Buddhist precepts, temple food is based on vegetarian or vegan recipes, and it is also based on the Dharmic concept of ahimsa (non-violence). 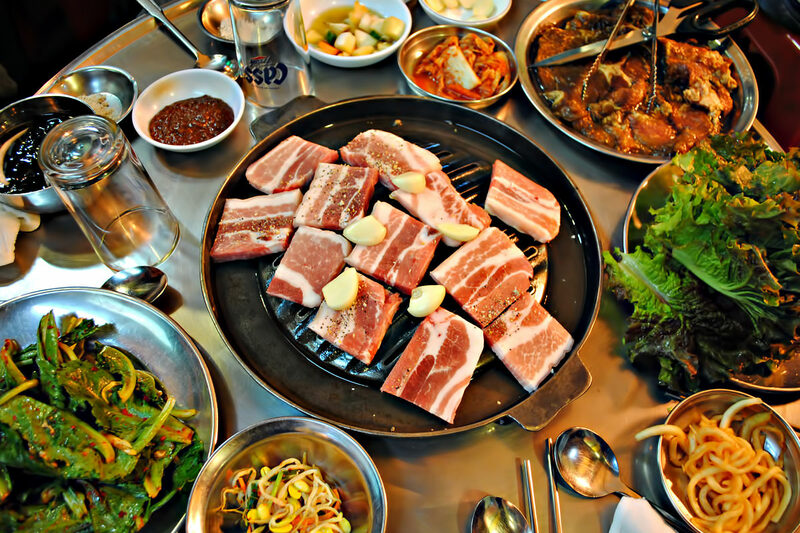 “When Americans talk about Korean cooking, they tend to talk primarily about barbecue — fatty strips of beef and pork sizzling on a hot surface. Temple cuisine forsakes these flavors, as well as the bloat and delirium that are usually associated with the party-down, soju-dizzy, every-dish-comes-at-once mode of Korean feasting. Instead, temple cuisine is all about delicacy,” New York Times reports. The link between Korea and food is very strong. If on one side the country seems very open to introducing foreign influences in its diet, on the other side there is a deep attachment to the traditional foods. In fact, dishes like Boshintang (dog stew), Beondegi (silkworm pupae), Sannakji (live octopus) or Gaebul (live spoon worms) are still common in South Korea. In the 19th century, Ludwig Feuerbach, a German philosopher and anthropologist wrote, “Man is what he eats”. According to this theory, Koreans are proving able to add culinary innovations to their diet without forgetting the roots of their culture.